Cayenne Salve has been used for joint and muscle pain for centuries. It’s a remedy that my grandmother had passed down to her, and one I’ve learned over the years as well. This Cayenne Salve Recipe is easy to make and use, and it is very effective. Cayenne naturally works to reduce inflammation and relax muscles. It contains capsaicin, which is the “hotness” in hot chilis. Capsaicin is believed to temporarily effect nerves by blocking the signal sent to your brain that communicates pain for that area. This is why when you eat a super hot chili your tongue will burn and then become numb (probably not fast enough for most of us). When a cayenne salve is applied to the skin however, there is a tingling, warming feeling at first, followed by the pain signals being temporarily blocked. This results in pain relief for your joints and muscles, as well as a reduction in inflammation. 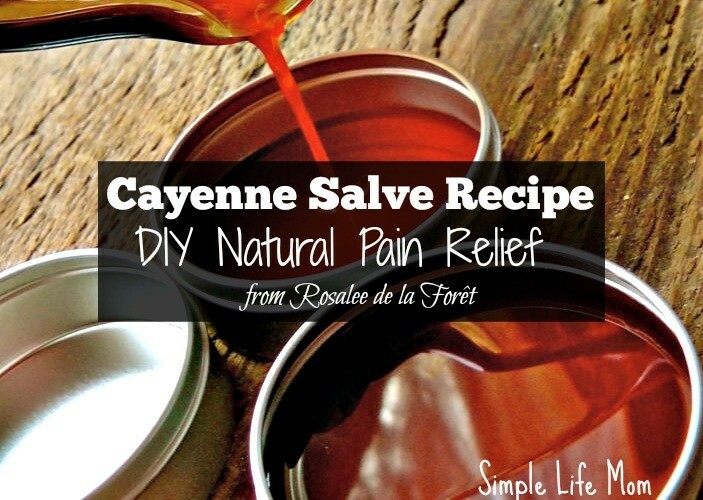 Rosalee de la Forêt is graciously sharing her cayenne salve recipe with us today. This is just one of SO many fabulous recipes found in her new book, Alchemy of Herbs. I received my copy just a few days ago and am loving every page! It’s full of delicious medicinal ways to use ingredients you probably already have in your kitchen. If you hurry, you can jump in and get the Bonuses for this book as well. They’ve officially closed extra entries into the Bonus Kitchen Apothecary, but I happen to know that it’s still open, so if you buy the book, make sure you head over there quickly to get the printables, herb labels, videos, and more. 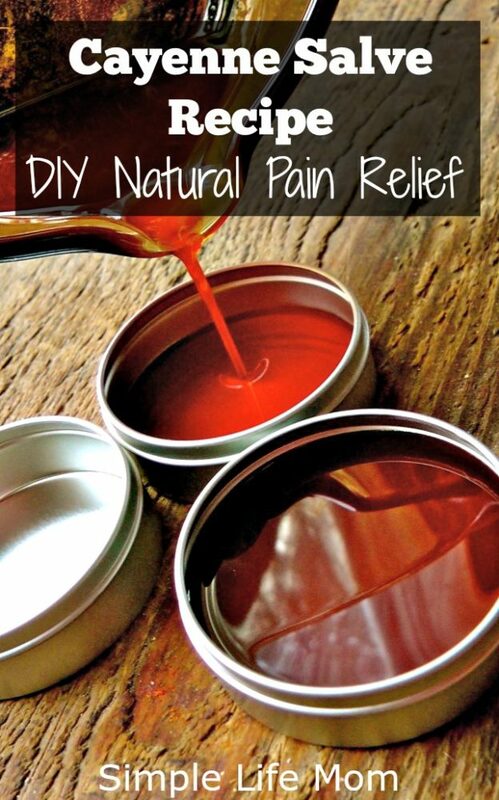 This simple salve can be made very quickly for minor pain relief. It works great for sore muscles and joints, bruises, and even nerve pain. If using for arthritic pain, use it daily, and note that it may take a week or two to see results. This salve can be stored at room temperature for up to a year, but use within six months for best results. This is a hot mixture! This salve should be used externally only, and not on broken skin, as it may sting open wounds. Even on closed skin, you may feel a bit of burning or heat in the area where it is applied. Sensitive individuals may experience tenderness or blistering. If this happens, discontinue use until the area is healed, then apply less often or in smaller amounts. Caution: When cayenne comes in contact with your mucosal membranes or eyes, it will burn! Be sure to wash your hands thoroughly after touching cayenne. Consider using gloves to apply the salve to the desired area. If you are using the salve on your hands, consider applying it at night and sleeping with gloves on. The first step is to infuse your oil. You can do this with a double boiler or slow cooker. Take care not to let the oil get too hot or “fry” the herbal material. 100˚F is an ideal temperature for the oil. Double-boiler method: Put 1 to 2 inches of water in the bottom of a double boiler. (Alternatively, fill a pot with 1 to 2 inches of water and place a tight-fitting bowl on top.) Place the oil and cayenne powder in the top. Heat over medium-low heat for about 20 minutes, until the oil is fairly warm. Turn off the heat and let stand for 20 minutes to cool a bit. Repeat this warming and cooling process for 2 to 3 hours. Slow-cooker method: Place the mixture in a slow cooker, yogurt incubator, or other low-temperature appliance that can maintain the oil temperature at 100˚F for 2 to 3 hours. Pour your infused oil through a strainer lined with two layers of cheesecloth. Gently heat the beeswax over low heat in a small saucepan or double boiler until it is melted. Stir in the infused oil and continue mixing until wax and oil are thoroughly combined. Immediately pour this mixture into jars or tins and let cool, then label the containers. GREAT idea! I make salves and I make tinctures… including a cayenne tincture, but I have not made a cayenne salve…. YET! I will add that to my list. 🙂 Thank you for the idea. Do you make yours as an oil rub? I had someone suggest adding cayenne to my frankincense extract oil. I think the combined anti inflammatory, pain numbing, and healing would be amazing. In my opinion they are fine. I don’t use aluminum for baking because at temperatures around 400 it starts off putting, but at room temps I think they’re fine. I am also an Alchemy of Herbs fan! I recently purchased about 28 gm of calendula flower powder and was curious if I could substitute it 1:1 in this recipe? I have your Calendula Salve recipe to hand but it calls for dried flowers vs the powder….any suggestions would be immensely appreciated! You can use a lot less powder when substituting for petals. I use 1/4 the petal amount or less. So if it calls for 1/4 cup of petals (4 Tbsps), I would use 1 Tablespoon or probably less of powder.